The Bahamas is unquestionably one of the top fishing destinations in the world. 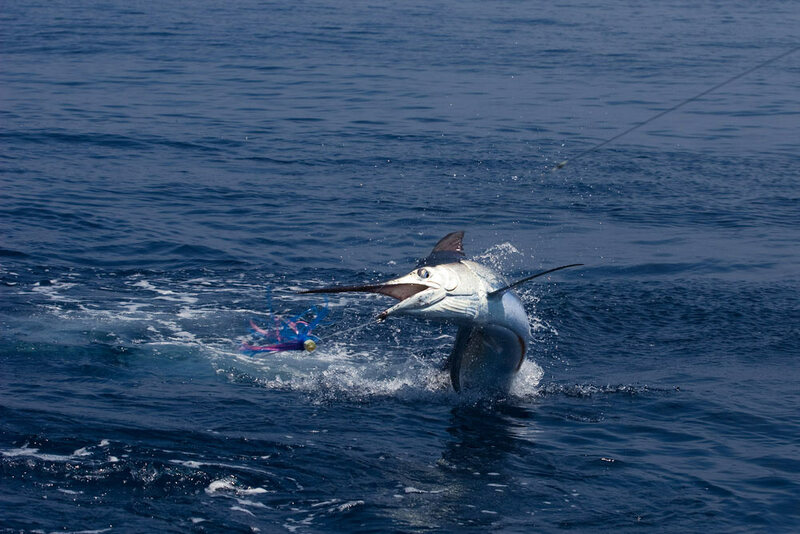 All of the right elements combine to make the Bahamas the ideal spot for your next fishing adventure, whether it be pursing bonefish, tarpon or permit on the flats or hitting deep water for marlin, sailfish, wahoo, tuna, kingfish or dolphin. Spearfishing enthusiast are restricted to non-trigger spears like the Hawaiian sling or pole spear. The options of edible reef fish are limitless…you definitely won’t go hungry with the varieties of snapper, grouper and other tasty fish that call the many miles of Bahamian reef system their home. Why is fishing so great in the Bahamas? Many variables come in to play starting with climate and the rich source of diet. Because of the countless miles of shallow warm waters and reef system, the food chain is thriving in the Bahamas. From the baseline microorganisms and micronutrients on up, there is an abundance of nourishment for the gamefish we love to catch. According to studies by the Bonefish Tarpon Trust, bonefish in the Bahamas grow 3x faster than bonefish in Belize. If you want to catch bonefish, Belize is a great destination. If you want to catch big bonefish, then the Bahamas is where you need to be! Big Tarpon and Permit can also be found cruising the same flats in search for shrimp and crab. With the right guide, some stealth and a little luck, you’ll have line peeling down to your backing in no time at all! Blue water beckons in the Bahamas. Earnest Hemingway was instrumental in starting the International Game Fish Association (IGFA) and where did he spend all of his time? The Bahamas. When you combine the abundance of food supply, gulf stream, stretches of shallow water bordered by drop-offs 1000’s of feet deep…your going to find monster fish ready, willing and able to chase down your teasers and tear apart your ballyhoo within minutes of leaving your mooring. Whether your pursuing pelagic fishing in Bahamas crystal blue water or ghosts on the flats, make sure your equipment is clean, oiled and in top condition. These fish will test your reels and your willpower. The sound and memory of line peeling of your reel will last you a lifetime and keep you coming back for more! We’ve been providing private air charter service for fishing groups to the Bahamas for over 30 years. Many of our clientele are fishermen who come back year-after-year because the fishing is just that good! If your spending your valuable time and money to make a trip in pursuit of your dream catch, our one recommendation is to use a service that will make that dream come true. We’ve found two guiding services know the Bahamas better than any other, Angler Adventures and Yellow Dog Flyfishing Adventures. These companies know the right guides for each species of fish, the right time of year, the right flies and the right spot! They have relationships and contract rates with all of the top lodges, so you are paying the same price as if you booked directly with the lodge. The key difference here ~ unlike many lodges who want to book their rooms regardless of fishing conditions, Angler Adventures and Yellow Dog Flyfishing Adventures won’t sell you a trip if its not the right time of year to go! Don’t end up at the right lodge the wrong time of year (been there and done that and there is nothing more miserable! These companies provide additional services as well … helping with travel arrangements, matching the right guide with your experience level, making sure you have the right equipment for your fishing conditions, helping with schedule changes including last minute airline delays, coordinate food allergies, you name, they do it!! Don’t have just a good trip, make it a great trip by calling Angler Adventures or Yellow Dog Flyfishing Adventures!! Click to request a customized air charter quote or simply fill out the form in the right column of this page. Bahamas Boating and Fishing Guides from the Bahamas Minister of Tourism below.